HHAD: Hua Hin Information Portal, Nightlife and Entertainment guide, Maps, Bars, Guesthouses, Accommodation, Property, Golf and more. HHAD : we innovate, others duplicate! HHAD is Hua Hin's definitive information portal with an extensive bar, pub, club and entertainment venue guide for people who are looking for a little more 'sanuk' when the sun goes down in tropical Hua Hin, Thailand. We have grown since our launch in 2002 and now cover all aspects of visiting and living in Hua Hin. With our attractions guide you can also plan you daily activities and our event calendar and public holidays page can help you manage your trip to get the most out of your time in Hua Hin. Our guides and original Hua Hin message boards and Hua Hin forums are frequently updated by people that are out and about in Hua Hin. The Hua Hin Business Directory website has listings of many other local businesses and contacts to help you find what you're looking for. Take a look at our Hua Hin map to see around Hua Hin in detail. Hua Hin doesn't have the raucous untamed nocturnal debauchery available in Bangkok or Pattaya and there are no gogo bars here but there are places to go for that little extra fun if you know where! There are also numerous family orientated venues for those that are looking for a little more relaxation and serenity. Nightlife in Hua Hin is growing steadily and so is our list of sponsored bars and venues. Plus much more, with over 9,000 members and 3,500 daily readers we are the first and original Hua Hin forum. Special promotions are available this month at the City Beach Hotel in Hua Hin. Rates at this centrally located hotel start from only 1,317 baht per night. Book online through HHAD or check our complete Hua Hin hotel booking page for great rates at this time of year on Hua Hin hotels and resorts. Book your Hua Hin hotel, resort, guesthouse and accommodation online. 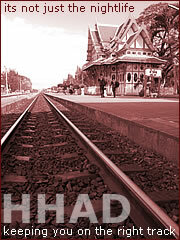 Hua Hin hotels and resorts: online booking available through HHAD. A fast and reliable Hua Hin online booking service! Our hua hin news page will keep you updated with current affairs in Hua Hin and Thailand. Check out our Hua Hin beaches guide to local beaches in and around Hua Hin. If your hungry our Hua Hin restaurants page will show you the best eateries in town. Find out more about Khao Takiab on the official online guide. The Hua Hin accommodation and Hua Hin guesthouses pages have info and rates on guest houses and rooms for rent in Hua Hin there is also a list of Hua Hin hotels. You can book your Hua Hin hotel online here. For more accommodation options take a look at Hua Hin Guest Houses and Hua Hin Accommodation. We also have Hua Hin houses section for houses for sale in Hua Hin and a Hua Hin real estate page with more up-market developments, a Hua Hin condos page highlights condominiums in Paradise City. Looking for a house to rent in Hua Hin?, check our Hua Hin houses for rent page or our Hua Hin rentals listings. Looking for houses, condominums or land for sale in Hua Hin? Then don't miss our extensive Hua Hin Property listings which we will be updating frequently. A recently launched website shows Hua Hin maps of all new Hua Hin property developments. Finally our Hua Hin travel page lists train and bus info, and our new Hua Hin tours page offers trips around Hua Hin. We also offer Hua Hin car rental, Hua Hin car hire and a Hua Hin taxi service. For the golfer there is a Hua Hin golf holidays and Hua Hin golf tours page. A brand new website with satellite Hua Hin maps and locations of local shops and services. Online guide to Bangsaphan and Ban Krut with info on accommodation, restaurants and travel.